Benign tumors of the lung are mostly silent and they are discovered in the course of lung imaging for other reasons. They can be divided into easily accessible ones in the main bronchial tree or peripheral ones in the lung parenchyma. This division also helps in the differential diagnosis as the anatomic structures and subsequently the histogenesis would be different between the two locations. Small biopsies from these lesions can be a challenge to differentiate from well-differentiated malignancies. Familiarity and integrating the clinical and radiologic findings are paramount to avoiding diagnostic pitfalls. Benign tumors of the endobronchial wall are similar in many ways to those in the upper oropharyngeal region and head and neck counterparts. Those in the lung parenchyma are specific to the alveolar tissue resulting in specific tumors to the lung. There is a slight overlap with tumors occurring in either regions but those are generally rare. 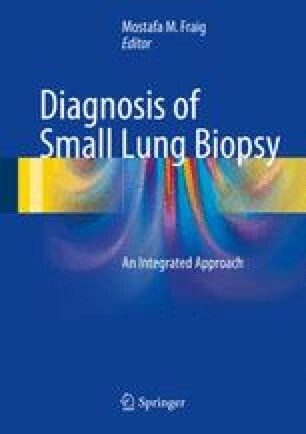 On small biopsy specimens, extreme care should be exercised to be conservative in rendering a malignant diagnosis when any of the clinical, radiologic, and cytologic findings do not fit the profile of that diagnosis. There is always the chance of getting more material for diagnosis.